]> SQUAREWHEELS.org.uk – 56.8 miles per hour on my bike! is correct to & last modified on 30 March 2012. Ever since I had a speedometer on my bike, I’d been doing everything I could think of to cause it to show ever-larger numbers. 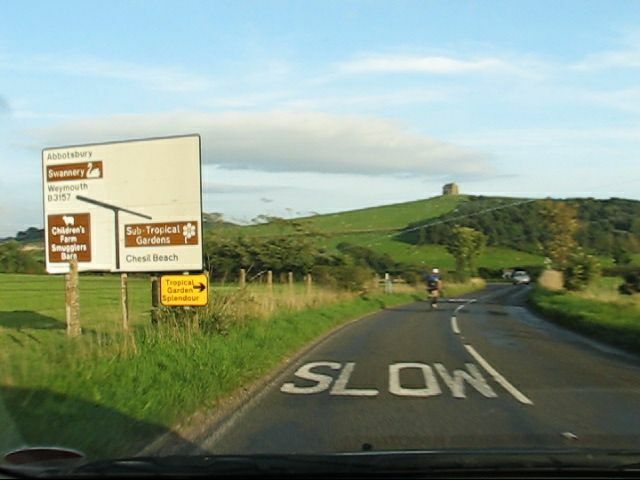 In September 1998, down an extremely-sudden not-very-straight plummet of B-road in Dorset, I achieved my very own bicycle ‘Land Speed Record’ of 56.8mph (91.4kph) which still holds to this day. Above: The already-steep road disappears over yet another local horizon as it gets more steeply downhill! The lush Dorset countryside, with Chesil Beach and the Isle of Portland in the distance, completes the scene. This is a frame-capture from the video-clip taken on a subsequent visit by car. Best not to think about it! This page is based on a posting I made to the uk.rec.cycling Usenet newsgroup in February 1999, and a video-clip taken by my car-passenger in 2009. Since fitting a digital speedometer to my bicycle in 1992, I had taken more than a year to find a downhill run upon which I could exceed 40mph. My own personal Land Speed Record of the big Four-Zero seemed tantalisingly just out of reach! By 1995, I’d found that 40mph on a bike was relatively easy given a suitable hill; I’d even reached 46.2mph at Morestead Down, Hampshire, and 47.6mph at the same location in 1996. Into ‘scary’ territory, by early 1998 I was finding that with enough bravery it was possible to reach about 50mph on various descents near Brill, Buckinghamshire, and near Willersey in the Cotswolds. Would future attempts result in even higher figures—or in hospital? 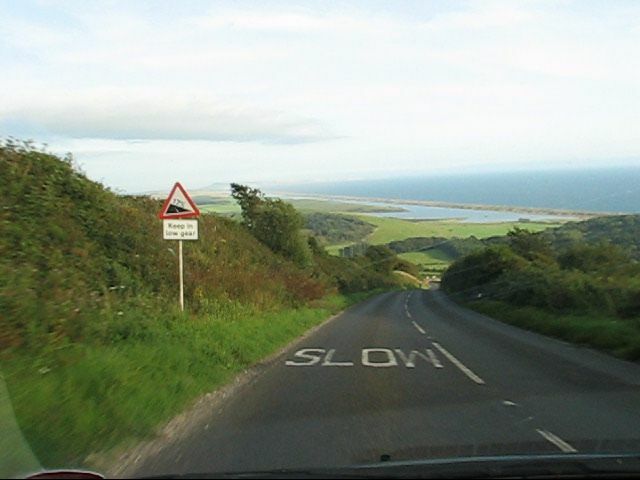 The B3157 is a secondary UK road which runs along the Dorset coast from Bridport at its west end, to Weymouth at its east: intermediate villages served are Burton Bradstock, Swyre, Abbotsbury, Portesham, and Chickerell. 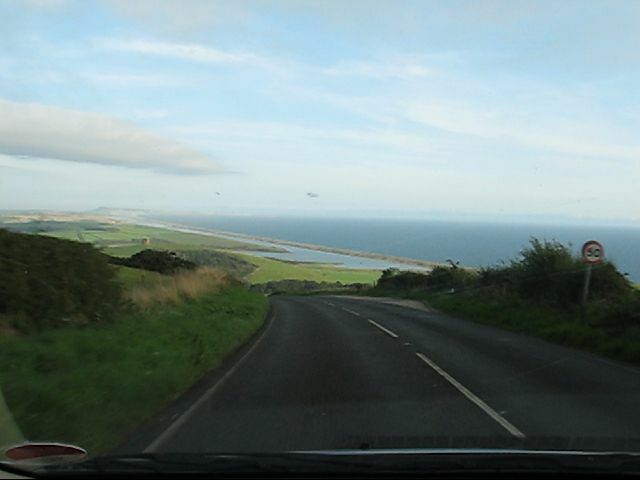 As with many coastal roads the terrain is hilly. At Burton Bradstock the road crosses the River Bride at just 5 metres AMSL, but as the hills east of there reach all the way to the shoreline, it has to climb them. 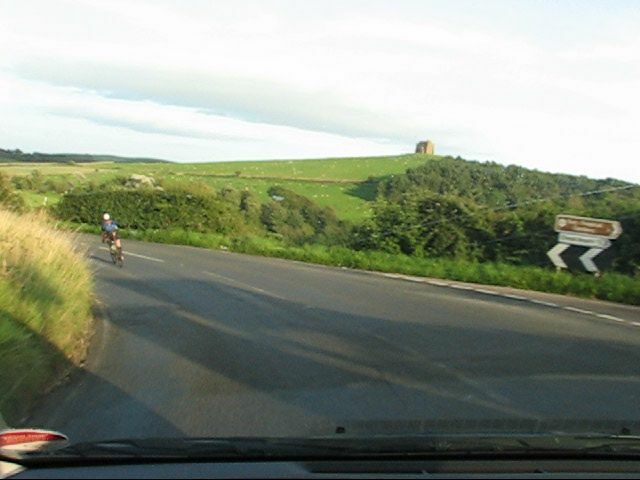 A high point of 184m elevation is reached, before the road then curves to the right and tips downhill to reach the relatively low-lying village of Abbotsbury. This downhill loses 125 metres’ height in 1100 metres’ travel—an average gradient of 1 in 9 overall, and with a steeper section marked as 17% (1 in 5.8) in the middle. I’d discovered this hill in July 1996, whilst returning from my first visit to Lyme Regis; I was heading back to Dorchester South station some 30 miles away. Despite being laden with front & rear panniers and having never seen the road before, I clocked 49.1mph which was at the time my new LSR! If I could do 49mph when not even particularly trying to beat any records, how fast could I manage if I really tried? 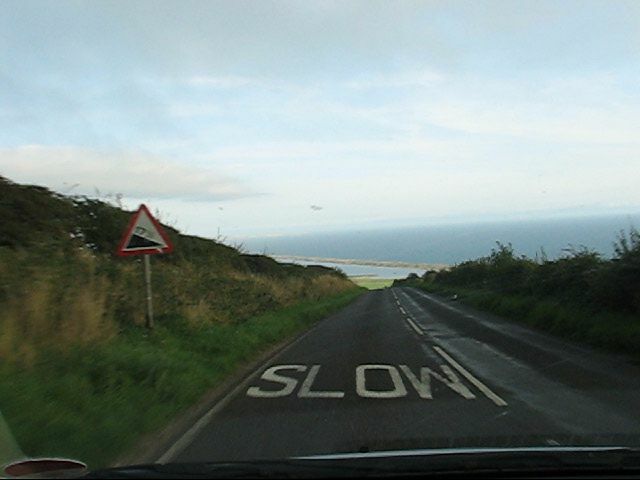 And what about the D-road (Bishop’s Road) that descends the same cliff even more steeply from the north-east into Abbotsbury? When the opportunity arose, I returned to Dorset with my 1994 Dawes Sterling (a relatively inexpensive touring-bike). Having visited the Hardy Monument, I sampled the double-arrowed downhill of Bishop’s Road which turned out to be disappointing as it was too narrow, twisty and bumpy to be really useful. 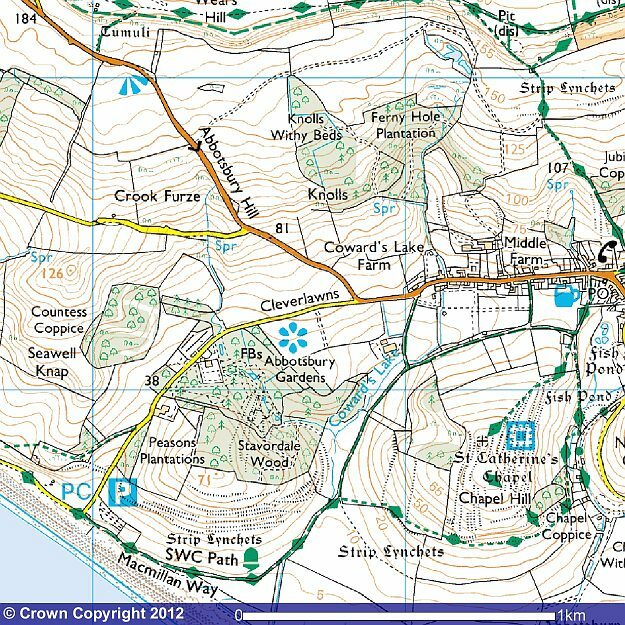 So, onto the main Abbotsbury Hill. 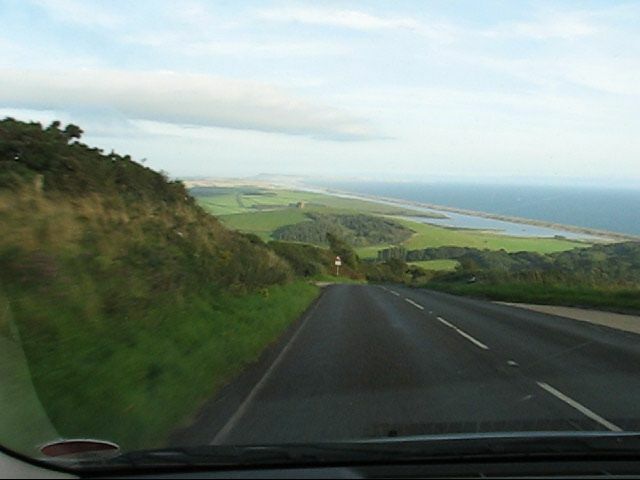 My journey was taking me westwards from Abbotsbury (i.e. UP the hill) but no matter: I rode half-way up, struggling with the weight of my luggage, then turned off into the entrance to a farm lane and removed panniers, barbag, waterbottle, flappy clothing (if I’d been more thorough, I suppose I should really have taken off the rack and mudguards as well, but I also had to get to Lyme Regis on a tight schedule!). With the above items cached in a bush, I (comparatively) merrily honked [rode standing-up] the rest of the way up; looked down onto the sea and along the cliffs, psyched myself up, checked front wheel quick-release and similar things for confidence, straightened glasses, and then … BLAM! Wait for a very long gap in the cars heading down, then push off with one pedal-stroke, change up to top, quick nervous brake-test; going along what looks like a flat piece of clifftop, but the road turns right and disappears away, every time you get to the horizon it’s dropped away further until you think you’re going down a cliff! View ahead is of road, high banks on either side of road, sun shining on the sea above that. Rapidly accelerating, now hurtling down already at about 45, passing an oncoming tailback of cars crawling up behind a smoke-belching coach full of grannies. 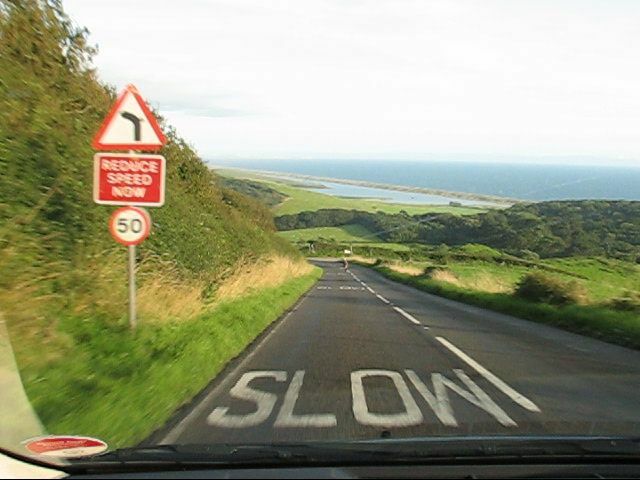 Slow down to 20mph and lean gracefully into the 90-degree left; safely round and off the hill, heading into the village. I laughed incredulously, almost maniacally as the adrenaline surge receded, and a huge grin was plastered across my face; performed a zippy U-turn (‘Easy without all that luggage’) and pushed the computer’s mode-button: MAX 56.8 m/h … really? Really!! That’s over 5mph quicker than my previous LSR! Blasting up the hill once again, past where I’d so recently been braking hugely, I was carried up by the left-over adrenaline back to my luggage. With hands still shaking, I attached all the bits and needed plenty of time to winch my way up the second half, up to the lookout once again. I reached the top, where the forward view changes from sky to hilltop to road. Then a wiry Veteran came into view; he saw the grin still plastered on my face, I nodded knowingly at him as he smiled back and tucked down into a full crouch. A fellow adrenaline-junkie! Still laughing, but also panting, I parked up at the view-point for the second time that day, and successfully took a photograph looking out towards Chesil Beach and Portland Bill without everything blowing away in the strong wind (strangely, I don’t recall any wind on the hill itself, only at the top which is quite exposed). 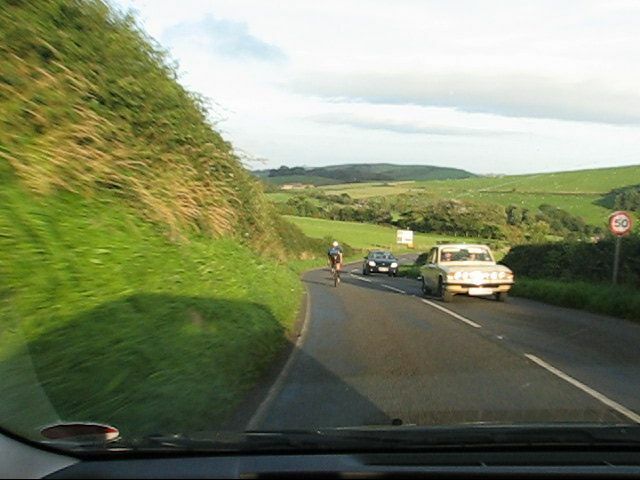 The rest of the ride was quite punishing but very rewarding in the summer-evening sunshine, leading up and down through Bridport, Chideock, Morecombelake, over the nasty steep bit, and down into (the sea!) Lyme Regis. 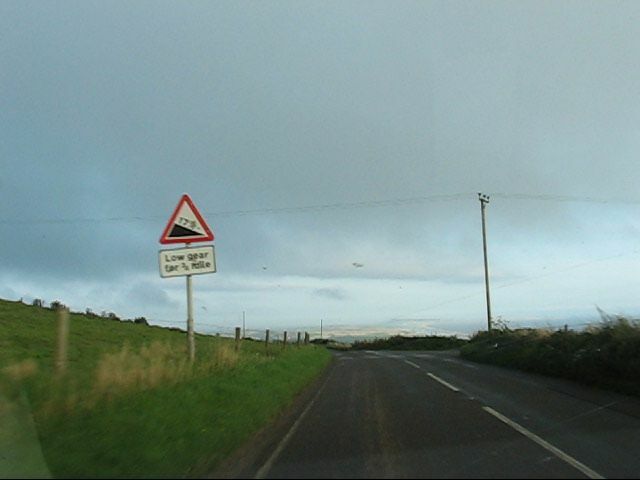 In 2009 I contrived to pass this way in my car, and my passenger took a video of the view ahead for this webpage; the images above are captured from the video. The scenery is pretty much as I had recalled in the text, but for me the crazy thing is that you’re travelling along what seems like an undulating road, but after reaching a gentle crest it tips way, way down to the right at around 1 in 6, then at the bottom it turns left again and you’re tooling along a flat road into a quiet village: it’s all so sudden and severe! See also Google Street View near the top, and near the bottom. I almost don’t like to consider the fact that, at the time I set my LSR, my Dawes Sterling’s frame had already sustained frontal crash-damage in April 1998 which would eventually prove fatal (to the bike, not me). The down-tube gradually broke completely during the course of a ride between Oxford and Cambridge in March 1999. I was ready for it and was glad when it finally broke in a gentle fashion after some minutes’ increasing unrideability—not when screaming down a twisty road at over 50mph!